HAPPY NEW YEAR ONE AND ALL!!! Well without further ado, here is the first chapter of 2018, enjoy! The faces of the High Elders of the Su Family cramped up. As the eldest grandson of the Su Family, he represented the “face” of the family, but now, this act of him getting off the stage like a crawling dog brought quite a lot of “honor” to the family. Seeing Su Yi’s way of exit, many people sent mocking gazes his way. He Yi Kuan, Mo Lai and Song Ming, the three of them looked at Su Jing Ting. Their words brought a hint of teasing, but there was no evil intent. It was just pure teasing. “This-, my nephew always likes to take an alternative path,” Su Jing Ting said, slightly awkward and helpless. 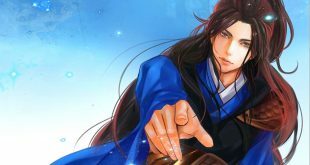 Liu Zong Yuan remained silent, but his gaze, whether intentionally or not, fell on Su Yi who had already left the platform. Behind Dharma Protector Wang, among the few haughty youths, there was a young lady around 16-17 years old. Her eyes fell upon Su Yi and could not help but examine him a tad more. The soft lips of the lady were cherry red in color, her eyebrows delicate. She was around 16-17 years old. Her lush black hair was tied back into a bun, through it a hairpin with flower engravings and at the hairpin’s tip hung a tassel. The bangs in front of her forehead drifted in the wind freely, absolutely stunning. Standing in the middle of the crowd, there were quite a number of young men looking at her discreetly. Su Yi acted like he did not know that people were staring at him after he landed on the ground., He casually walked to the center of the stage and stood together with all the young men and ladies. His eyes scanned the area and found out that the Song Family, Mo Family, He Family and the Su Family, each family had the same number of participants, but the Liu Family had a few more than the other four big families. Mo Bu Fan, He San, Song Wu Qiu, the three of them were finally standing together with Su Yi. They stared at him, their eyes spitting fire as they warned him discreetly. “Okay, after the test, I will be waiting for you three little brats,” Su Yi felt so helpless. Even though he did not want to bother with these three kids, but continually being pestered like this was not a way either. Looks like it has to be like old times, teach them a good lesson and they will become much more well-behaved. As Su Yi finished his words, on the platform, a man around 30 years old beside Dharma Protector Wang, stood up. A light shone beneath his feet and when he gently touched the surface, he shot up into the air. In an instant, there was a movement of light underneath the man’s feet. An intimidating aura suddenly exploded in the area. Under the surprised gazes of the people, a faint figure of a leopard around 3 meters in length appeared under the man’s feet, its teeth baring, claws extended and eyes leaking out a ferocious gaze. It was as if it was real. The man waved his sleeve and moved. His feet stepped on the faint leopard. With a dull sound of breaking the air, he slowly landed on the square, facing towards the dozens of young boys and girls and the faint figure of the leopard under his feet also disappeared after that. Seeing what that man just did, the spectators were shocked, their eyes trembling. Some were filled with jealousy, others filled with yearning and respect. Yuan Qi Materialization, that was a sign of a Yuan Spirit Realm expert. It was enough to prove that the man was already an expert of the Yuan Spirit Realm. Every realm before the Yuan Soul Realm was just the beginning. When you reach the Yuan Soul Realm, that would be the time when you could be considered a real martial artist. After the Foundation Building Stage, it is the Yuan Soul Realm, then it is the Yuan Xuan Realm. After the Yuan Xuan Realm, it is the Yuan Spirit Realm. When one reaches the Yuan Spirit Realm, Yuan Qi can materialize and that represents that you are among one of the strong. In the entire City of Man, those who could reach the Yuan Spirit Realm could be counted with one hand. Only the respective Heads of the large families were Yuan Spirit Realm. On top of the platform, seeing that man’s Yuan Qi materializing, Su Jing Ting, Liu Zong Yuan and the rest could not help but have a change in their facial expressions. Though they may also be in the Yuan Spirit Realm, that man was only slightly more than 30 years old and any one of themselves was already over 40 and even nearing 50. The faint figure of a leopard beneath the man’s feet was a sign that he had long since entered the Yuan Spirit Realm and may even be at Yuan Spirit Realm Third Grade. How could this sight not shock the heads of the big families? Now, the heads of the big families, the upper echelon, all wished even more for the younger generations of their families to be able to enter Sacred Mountain. Su Yi’s eyes also fell upon the man. Yuan Spirit Realm, that was already enough to be among the strong. The man landed and his eyes swept over that bunch of young men and ladies and with no one having a clue how he did it, in his palm appeared a stone which was as tall as half a human body. The white stone was like white jade. It had a shape of a stone wall and was crystal clear, the man placed it on the stone platform which was already prepared in the center on the stage. “He has an interspatial bag!” Su Yi was slightly surprised. This man definitely has an interspatial bag. Inside an interspatial bag was an isolated space. Even though its value was not equal to its price, the cheapest interspatial bag was still not something any Yuan Spirit Realm expert could buy. Seeing the man, Su Yi now had an even greater desire to enter Sacred Mountain. This man simply having an interspatial bag, Su Yi was not at all suspicious. Thinking about it, he knew that Sacred Mountain must be filthy stinking rich. When he enters Sacred Mountain, he may even be able to reap some rewards. But the upper echelon of the respective big families, their eyes were instead on that Yuan Testing Stone. The Yuan Testing Stone was not an average simple item. Even in the entire city, it would be hard to have it. Hence, it was also hard to check the talents of the younger generations. The man did not bother much with the astonished gazes and had everyone started preparing for the test. In front of the expert from Sacred Mountain, these youths who were normally proud in the city were now nervous and acted very cautiously. A young man from the Liu Family approached first. After greeting the man with a bow respectfully, he followed the man’s instructions. He lifted his hand and grasped the Yuan Testing Stone. Yuan Qi flowed in his body. From the center of his palm, a wave of Yuan Qi rushed into the stone. As the young man began his test, the loud noises and chatter of the surroundings begin to die down and all the gazes fell upon the center of the stage. On top of the platform, the upper echelon of the Liu Family including Liu Zong Yuan were all very nervous in their hearts. This young man had performed exceptionally well in the family from young, but they did not know whether it was enough to have a chance to make it into the Sacred Mountain. As Yuan Qi rushed in, the Yuan Testing Stone which was on top of the stone table began giving off a light. Like it was being dragged by something, a very intimidating aura rushed out suddenly, forcing the surrounding youths to back off involuntarily, almost falling. At the same time, four different colors of light: gold, green, black and cyan, gushed out of the stone, but it was fast and faded away in a flash. The Yuan Testing Stone begin to calm down afterward. As the Yuan Testing Stone calmed down, the voice of the man also began to travel and resonate in the entire venue.